The first time she saw the head of Henry John Klutho, she was in a rarely open “pocket museum” the size of a small house on the riverwalk downtown. There was the head. There were those high, strong cheekbones. There was that big aquiline nose. If it’s possible to fall in love with a disembodied head, Frances fell in love with Klutho’s head. She took advantage of the fact the head could not look back and she looked into that powerful, poetic face and looked all over his face and looked into the eyes that did not blink. She came back several times, but the museum was always closed. She was overjoyed the next time she found the museum open, but she quickly discovered the head was missing. The volunteer historical society staffer didn’t know where the head had gone, had never seen it, didn’t know what she was talking about. It was years before she saw Klutho’s head again. Henry John Klutho moved to Jacksonville after reading in The New York Times about the fire that destroyed nearly the entire city. In its ashes, he saw a blank slate. He would later quote Desiderius Erasmus that “In the land of the blind, the one-eyed man is king.” And then a newspaper editorial cartoon would show a baby Klutho playing with his building blocks, but his building blocks were all the buildings he had designed in the Jacksonville he helped rebuild from the fire. 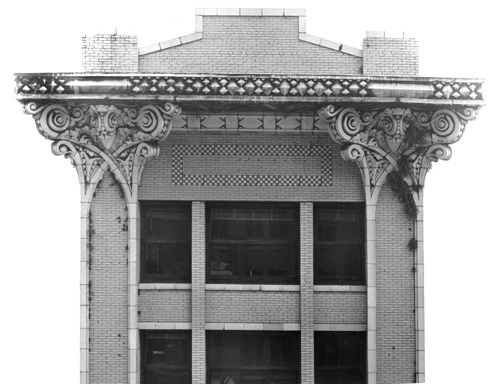 A 1909 newspaper article referred to the Seminole Hotel as “the new architecture.” In it, Klutho merged the steel-frame skyscraper design of Chicago’s Louis Sullivan with the Prairie School of Frank Lloyd Wright. 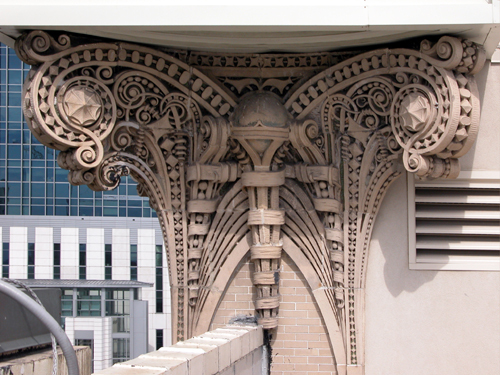 The building even bore capitals beneath its 10th floor that featured a particular terracotta crosshatching that became known as the Prairie School Cross. It also bore between terracotta arabesques the Indian heads for which the hotel was named. 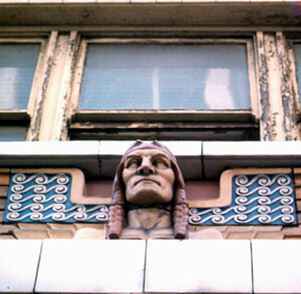 The Seminole Indian heads on the Seminole Hotel were also signatures of the architect. The Seminole heads were modeled from the architect’s face. In 1974, the Seminole Hotel, bearing the architectural signature of the city’s greatest architect, was demolished to make way for a parking lot. Somehow, someone, it’s whispered about, but no one will say who, salvaged the heads. Someone stored the heads away. The glass octagonal dome of the St. James Building spans 75 feet. The dome is spanned by beams upheld in their corners by eight statues of bald and bearded strongmen holding the beams on their backs. The St. James Building replaced the St. James Hotel, destroyed in the Great Fire. At the north end of Hemming Plaza, in the very center of the city, the St. James now hosts City Hall. 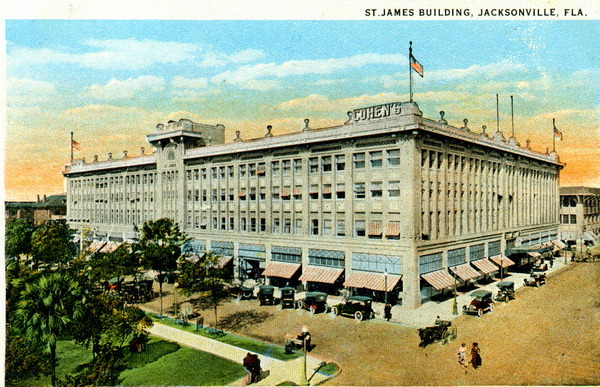 It was built, however, as the Cohen Brothers’ Department Store in 1912. They call it Jacksonville’s architectural magnum opus, and the greatest work of the city’s greatest historic architect. The dome was rebuilt in the 1990s, the statues were recreated, the terracotta scrollwork capitals were restored. The St. James had stood empty for years. Preservationists had pointed to it to indicate how little the city cared about its most beautiful architecture. In 1926, Klutho still kept his offices in the building, but the owners decided to remove the glass dome for more commercial space. He moved his offices from his masterpiece in protest. 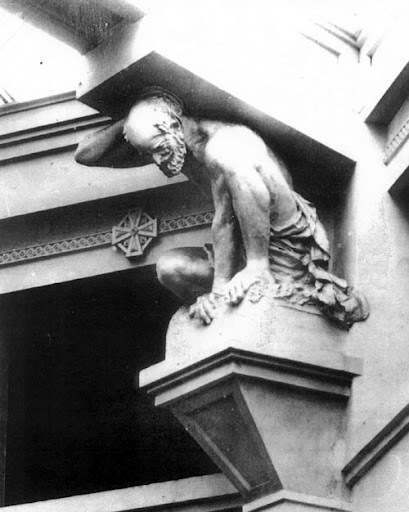 When City Hall moved into the restored St. James in the 1990s, the recreated statues holding the skylight beams on their backs were built too small and stuffed with Styrofoam. It’s whispered that someone, somehow, salvaged the original statues, that they still exist somewhere in the city. If anybody knows who has them, or where the statues are locked away, no one is saying. 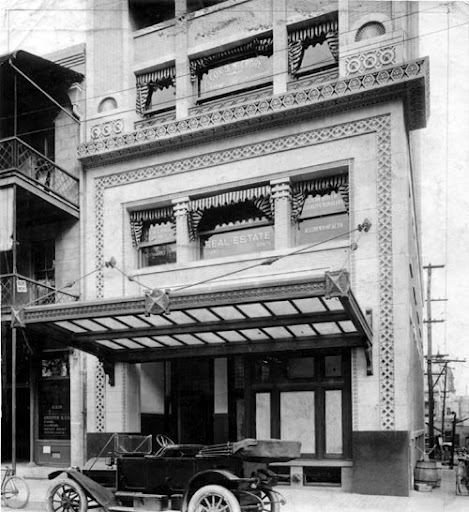 From 1929 to 1934, Klutho kept his offices in the Klutho Apartment Building, built to house silent screen film stars. Oliver Hardy and Tom Mix and Charlie Chaplin. Four cantilevered balconies overlooking Main Street. Two-story leaded glass window above the arch above the centered doorway. 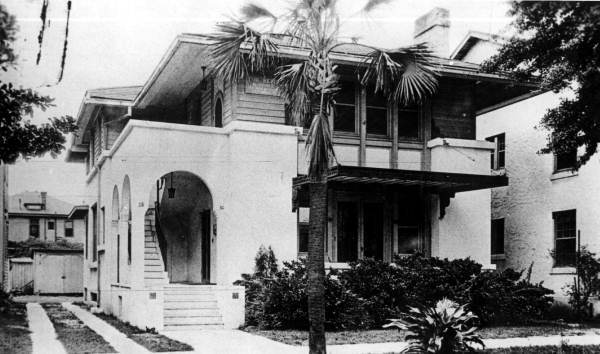 In 1917, he had opened his film studios on West Ninth Street, adjacent to the apartments, but already fewer movies were made in Jacksonville and film studios were closing or relocating to Los Angeles. His studios closed in 1922. But he designed the Klutho Aparments in 1913, when the film industry still held promise, and he designed the building as a leaded-glass Prairie Style showpiece, what one historian called one of the greatest works of art ever composed in this city. Gold-leaf windows shaped into diamonds and interwoven circles and rectangles and hexagons, rhythms of pattern of light and void. In 1943, the building’s new owner renamed it Dionne’s Springfield Apartments, and 50 years later a fire destroyed three fourths of the building. What were the odds that in as conservative a city as Jacksonville, in as neglected a neighborhood as Springfield, a $2 million restoration of the façade and recreation of the destroyed portions of the building would have occurred in the late 1990s? The first time she saw those particular shapes, those diamonds and raining verticals and interconnected shapes in green and red and yellow, the first time she saw those windows, she thought they were Frank Lloyd Wright windows. She saw them in the wretchedly run-down Dionne’s Springfield Apartments. She also saw the Prairie Style Cross in the Florence Court Apartments across Main Street, and suspected the ugly concrete that covered the Florence Court also covered a symphony or a lyric poem of an architectural masterpiece. Then Frances saw the same leaded-glass designs in the stair-stepping windows corresponding to the staircase in the side of the house Henry John Klutho built for himself. The former Klutho residence on West Ninth Street had originally stood next to the apartment building on Main Street where Frances had first seen the windows. Then Frances noticed the cross on the Florida Life Building on Laura Street and the Morocco Temple on North Newnan. She thought of the Biblical injunction that anyone who would follow Jesus should give up all his possessions and “take up his cross daily, and follow me.” What did it mean that instead of her taking up the cross to follow a Savior, Klutho’s cross now followed her all over the city? The veranda had been enclosed with glass and boxy rooms had been clumsily added in the 1960s and 1970s. In 1996, a local tailor saw the Riverside house and knew he had to buy it to save what he called the substructure beneath years of abuse. The house at 1649 Osceola Street had been used as a halfway house, offices, and partitioned apartments. If it had ever been anything important, people had forgotten about that, covered up its beauty, and forgot about it again. In 1976, someone found house plans in the attic that bore the signature of Henry John Klutho. When Frances interviewed the tailor, he walked her through the house, which was almost entirely empty. He was living with his wife in the basement while he worked on the rest of the house. He showed her the leaded glass windows he planned to reinstate. There were 17 of them. They had been stored away in the attic, while cheap clear replacements had become barely translucent. Frances looked at the windows in his hands and she saw it, that symbol she had seen in other fabulous and fantastical buildings in old parts of town, the Prairie Style Cross, but also what the tailor called the Prairie Style “tree of life.” There were green and red and yellow and wonderful interplays of verticals raining into diagonal arrows and diamond shapes. So much damage had been done to this house by its various landlords over the years, the tailor said, you had to do so much undoing before you could start doing. Klutho had built the house for Alexander St. Clair Abrams, a lawyer and writer for whom he also built a mausoleum in Evergreen Cemetery in 1901. The mausoleum was Klutho’s first local commission. In decades prior to the house’s restoration, the St. Johns Quarter of Riverside had been perforated with transient housing and drug crimes. Frances thought the tailor’s living in the basement of a masterpiece while he systematically restored it worked as an emblem for the Quarter itself. And the crosses she had seen on Main Street and Laura Street and Newnan Street and Osceola Street were more pagan things than the crosses of Christian crucifixion. Then, so unexpectedly, she saw the head of Henry John Klutho when she babysat her neighbor’s little girls and walked them through the “Currents of Time” exhibit in the Museum of Science and History, beside the Aetna Life Insurance buildings that used to be the Prudential Life Insurance buildings on Prudential Drive. The exhibit included several winding walkways moving from Timucuan Indians through the Jacksonville silent film industry into the rise of military bases in Northeast Florida and local football teams. In the early 20th century section, Frances walked with her neighbor’s children past cardboard cutouts and printed information about Henry John Klutho, and there, hitting Frances like the sight of a ghost of first love, was Klutho’s head. Because he could not look back, she looked into his face and all over his face and into the eyes that did not blink. She felt shameful about it, but also shameless. She felt free to love him, free. She had found him. He had followed her all over the city.